I've gotten this pop up a lot lately. When I click on the link or what not it takes me to the play store and has me download, (360 security) this happens when I close my browser (Google Chrome) and then come back to the browser or reopen the browser it says this. Does anyone have any idea on fixing this? I have lookout and the 360 security it made me download and no virus show up. Clear Cache and Data in your browser. Uninstall the security app. 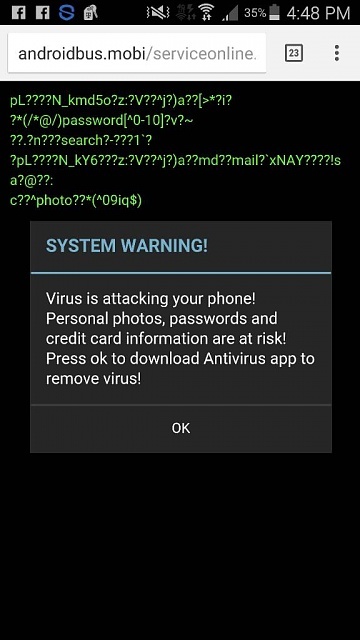 I've been getting a warning that says it's from Google and my Android is at serious risk. And tells me to update. I won't click the update because I don't know if it's real. I have screenshots of the message. If anyone can help me out I'd be grateful! Same answer as above, but even more so, since from what you say someone is presumably fraudulently claiming to be Google . How to make multiple home screen shortcuts on the home screen? How to root the Droid Turbo?